It Takes Two to Strangle is Stephen Kaminski's first novel, featuring amateur sleuth Damon Lassard as the "Dabbling Detective" in this new mystery series. Former professional baseball player Damon Lassard has recently settled into the small, fictional community of Hollydale in Arlington, Virginia, to be near his single mother. Having no major need for a job after his baseball career left him financially secure, the 31-year-old handsome lothario keeps busy with a number of activities that include volunteering at the local library, serving as president of the Hollydale Citizens Association, and pining over his crush, the beautiful local weather girl Bethany Krims. When a carnival arrives in town for the 4th of July celebration, Damon, as the head of the local citizen's association, is responsible for overseeing its setup. However, a kink is soon thrown into plans when the carnival's owner is found murdered by alleged strangulation. Feeling concerned for his fellow citizens of Hollydale, Damon takes it upon himself to "dabble" in the midst of the murder investigation alongside his friend Detective Gerry Sloman (who seems to hold a love/hate regard for Damon's assistance) to try and help solve the murder. Damon's character is mostly modest, but also slightly pompous at the oddest times. Overall, Damon is charming enough to form an attachment to. The interactions between Damon and the other characters are warm-hearted and funny, especially between all the women! Damon actually has his hands full with multiple women in this novel - a component that is sure to be duplicated in future novels of this series, which is quite hilarious to think about. The mystery in It Takes Two to Strangle is indeed intricate - but could be a bit too complicated and messy to follow while keeping your full attention. I'd like to disclose (without revealing any major spoilers) that the murderer doesn't seem to have a large role throughout the novel, which is disappointing! Part of the fun with reading cozy mysteries is being introduced to all potential suspects up front, and spending time throughout the novel to figure out "whodunnit." The lack of this particular element can make the mystery too difficult, or sometimes even impossible to solve, which is how I felt about It Takes Two to Strangle. Overall, It Takes Two to Strangle is a satisfying debut! It's got all the favorable elements of a cozy mystery: a heroic protagonist who's easy to admire, a cast of characters you can warm up to, the feeling of community that's ever present in a small, close-knit town (along with its notorious busy-bodies and gossips), a love triangle, and more. With these core elements, any shortcomings or flaws in the mystery and crime procedural portion in It Takes Two to Strangle can be easily overlooked. Kaminski has laid excellent groundwork for his new series! 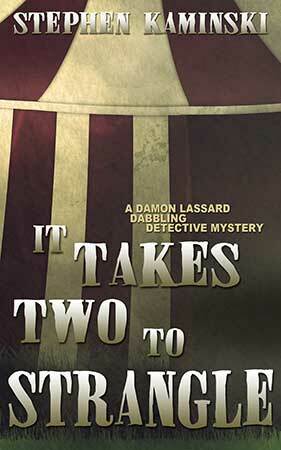 I'm looking forward to Stephen Kaminski's next novel in the "Damon Lassard Dabbling Detective" series! I'm optimistic that the next novel will be even better, especially given we'll have a rapport with the characters and Hollydale community. If you enjoy cozy mysteries such as the Hamish MacBeth and Agatha Raisin series by M.C. Beaton, the Haunted Bookshop mysteries by Alice Kimberly (AKA Cleo Coyle), and the Coffeehouse series by Cleo Coyle, you'll definitely enjoy your time with It Takes Two to Strangle. What are your favorite mystery books or series? Who are your favorite cozy mystery authors? Share your thoughts with us in the comments section below.